Individuals living in one of the listed cities can browse through charities which we have audited and evaluated to ensure that clothing donations are being used responsibly. This typically means that the clothes are not sold, and that all or most of them are redistributed to individuals in the local community with a real need. Good Shepherd Toronto and The Mustard Seed Edmonton, two charities which assist homeless individuals with with basic clothing needs, food and shelter. Dress for success Red Deer which assists women find work appropriate clothes for new jobs and interviews. Wolsely Family Place, providing free meals, clothing, parenting support, health education, prenatal classes, playrooms and more to families in need. Elements Calgary, which provides confidential and non-judgmental support to over 1,200 Calgarians annually who are challenged with mental illnesses. Women's Centre of Montreal, which provides vulnerable women and their babies with clothing, educational and vocational training as well as counselling. Basically Babies which provides babies born to families in extreme need with basic clothing and other essentials for their first year of life. 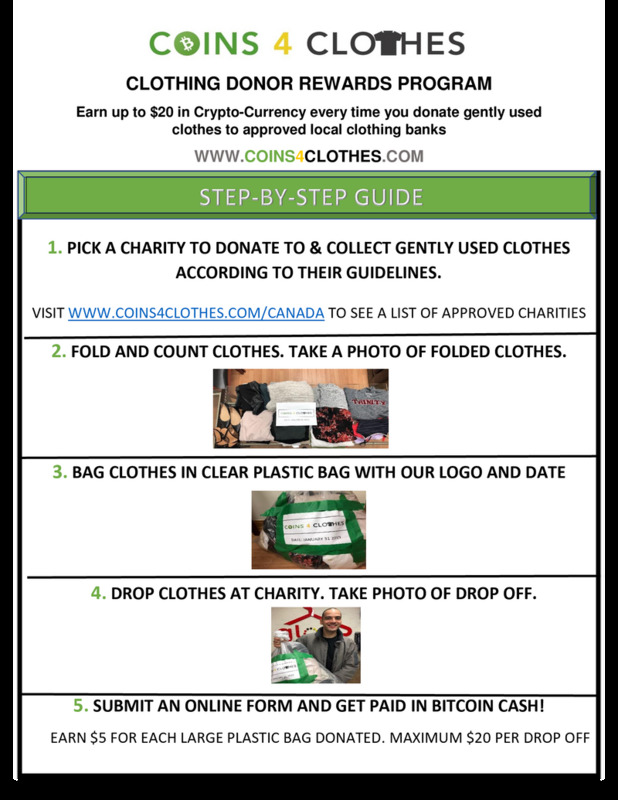 To start earning Bitcoin Cash you simply need to live in Canada and have some gently used clothes to donate. If your city is not listed, you can always nominate a charity, and if we approve it, you can start earning BCH every time you donate clothes there. Users who tweet about their experience can also earn $5 from the Bitcoin Cash tip bot @tipprbot ! As part of the on-boarding experience, we ask all donors to complete our Bitcoin Basics guide, where they will learn about the history of Bitcoin and Bitcoin Cash, the key major differences, and will be walked through installing their first Bitcoin wallet, receiving some free coins from our new Bitcoin Cash Faucet (Shout out to @Gitcash and @Imaginary_username for creating it). We are offering a $25 bonus to the first donor to take part in our new Clothing Donor Rewards program. This means that the first person to donate could earn $50 by donating 4 large bags of clothes and tweeting about their experience. We look forward to helping introduce more people to Bitcoin Cash while spreading good will around Canada! Visit www.coins4clothes.com for more details.